...and so the list grows as far as Bircham Tofts, about 10% of Norfolk's parishes now represented. Information in previous post still applies. Recent announcements about Norfolk parish registers have been made by FindMyPast and TheGenealogist (thanks to Chris Paton for the latter announcement published on his brilliant blog). FindMyPast have added browsable registers, many (but not all) of which have been available in the same format on familysearch.org for several years - if you knew where to look. TheGenealogist announcement suggests when they launch there that they will be matched with transcriptions, which aren't currently available at FindMyPast, and only for a small minority on familysearch. So exactly what is available where? The biggest collections remain searchable in person at Norfolk Record Office: The Archive Centre and slightly fewer (basically the non filmed/digitised ones, essentially the most recent deposits) at Norfolk Heritage Centre. Online, you can search most Church of England transcriptions at FreeReg (now FreeReg2). I'd estimate this at roughly 80%. Then you've got maybe 60-70% available to browse on familysearch.org and now FindMyPast. (Worth looking at FreeReg first if you don't know where exactly to look). However, as with everything, there are gaps, so what exactly can you see and where can you see it (if at all)? Well, I've started putting that all together for you, starting with Acle to Beeston Regis (approx 1/14th of Norfolk's parishes). Some registers are still at churches, some were destroyed during the last war, or through centuries of fires and floods. Luckily, most were not. The attached gives the name of the parish, the PD number (Parish Deposit - look under this number on Norfolk Record Office's catalogue and you'll find a lot more than simply the registers), and which years are available in their original form, on microform and on the greatest holders of digital records and transcriptions - familysearch, findmypast and freereg. It doesn't include whether there are archdeacons' or bishops' transcripts (there probably are in most cases) or additional transcription sources (again, there probably are in many cases, whether printed, on NORS, extracted in various collections on ancestry or transcribed on familysearch (beware the later, always check the source)). More information on transcriptions available can be found on the Record Office's website. I doubt that where the websites claim to have earlier or later entries than the Record Office's own catalogue that they really have (at least not comprehensively) unless (in FreeReg's case) they have transcribed earlier bishops'/archdeacons' transcripts (this does happen occasionally where transcripts survive but the parish registers were destroyed). Parishes prefixed with words beginning with other letters may currently appear to have no online records. In reality, some of them do, but I'm working logically through the online collections. In some databases, for example, "Barningham, North" as I have indexed it, will not appear until I get as far as "North Barningham"
Of course while I have spent a significant amount of time collating this information, I may have slipped up here and there, so let me know if you find any errors. I'll be gradually adding further parishes over the next days and (probably) weeks until I reach the end of the alphabet. Once the registers go live on TheGenealogist I'll be updating the list again...! I'm delighted to say that after spending a rainy weekend on a graphics programme I have drawn and labelled up some useful Suffolk maps. I've just uploaded two to my new 'resources' page - one indicating the state of Norfolk parishes c1850 with plenty of notes about changes to civil parishes, and the second showing these along with the 1837 Registration District boundaries and notes about those districts that were not just confined to Suffolk. Hopefully these will be useful to others. Any mistakes are mine and if you let me know of any corrections - providing I can verify them - I will update the maps. Next on the agenda is to produce later district maps and Poor Law Union maps which I'll upload as time allows. 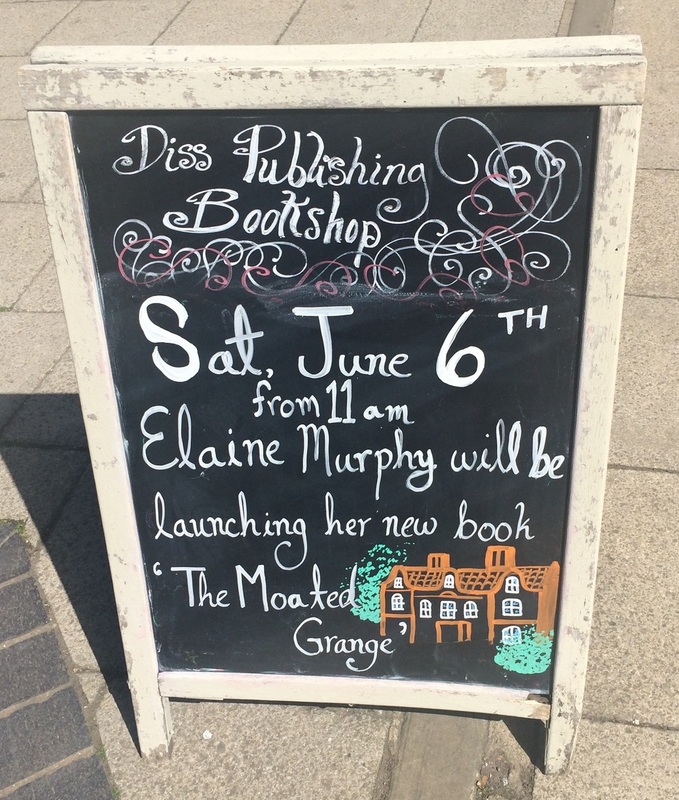 A post today to congratulate Elaine Murphy on the launch of The Moated Grange this morning at Diss Publishing Bookshop. I am completely biased as I was a behind-the-scenes researcher on the book, but I think it's a cracking read, telling the story not just of the house, but the people who lived within it, and the context they found themselves in. 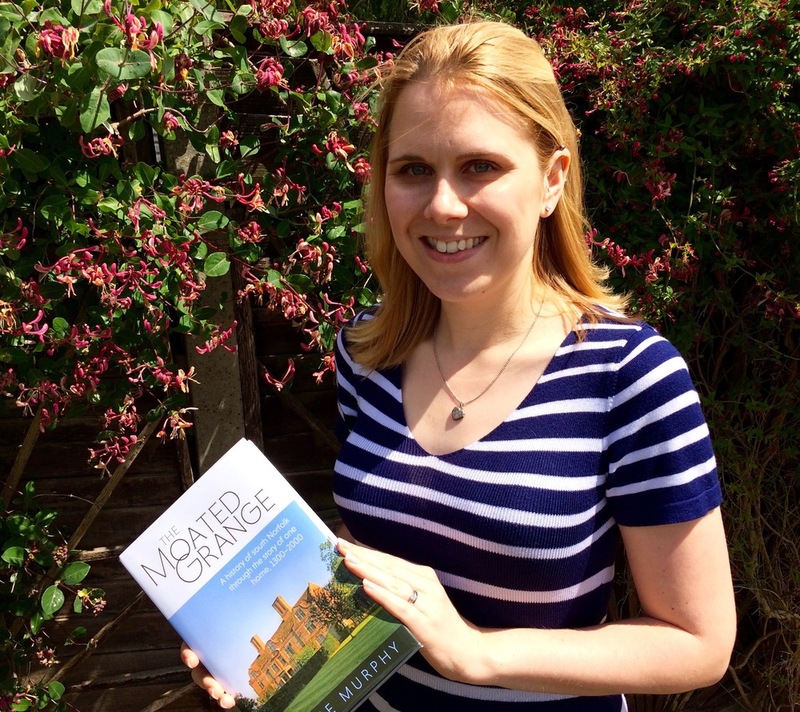 Not only is it a history of south Norfolk through the history of one house (in between Diss and Harleston), but the story takes us as far as Cambridge, the Fens, and the Inns of London. The book has been an ongoing project for several years now - in that time I've completed a Masters, had my own work published, got married, moved house and held three different full-time jobs (not necessarily in that order!). It is wonderful to see the research in print: you can purchase it from several Norfolk bookshops - and online - and will shortly be able to borrow it through your Norfolk library. I originally heard of the house as a child. My Great Great Grandfather was born there, and it had been in the Walne family for just under a century, although not always occupied by them. I grew up with tales of the Grove and the Grange in Brockdish which "had 'W's on the downpipes". It was a surprise to receive an email from Elaine, not long after this website first appeared online. She didn't know at the time that us Walnes were still 'about' in the county. The research has come a long way since then. 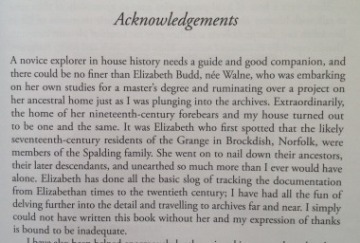 The acknowledgements (below) are very kind, as all the hard work taking research further and visiting archives up and down the country, not to mention all the writing up, story telling and editing, have been done by Elaine herself. 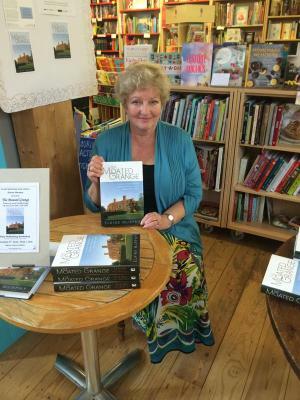 There will be an author talk, question and answer session and book signing at Norfolk Heritage Centre (upstairs at Norfolk and Norwich Millennium Library) on Thursday at 2.30pm. All are welcome and it's a free event. My grateful thanks to Elaine for the opportunity not only to visit a former family home, but to contribute to her project.